Garage doors are joining the growing list of home products that are being manufactured with an eye toward safeguarding the environment. The Door and Access Systems Manufacturers Association (DASMA), a trade group, has drawn attention to some of the steps garage door makers are taking to clean up their act, and their product. Here are some of the things the DASMA suggests looking for in garage doors that can help you make a greener choice. Insulated garage doors are especially useful if you heat your garage, even occasionally, and if the garage has living space above it. While many garage doors claim to be insulated, the levels of insulation vary considerably. A door with an R-value of 18 will be a much better insulator than an R-6 door. Wood doors are made with a renewable product, and wood composite doors combine renewable and reccled components. Some companies offer composite doors made with 100 percent recycled wood fibers. Most steel doors contain a fair amount of recycled material. 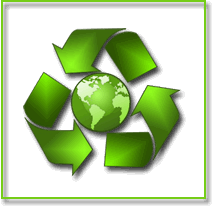 Some door makers are proactive in recycling the scrap produced in the manufacturing process. In the manufacturing process, how paint and other finishes are applied, and how the excess finish is disposed of, can make a big difference in its "green-ness." At least one manufacturer, Martin Door, uses a sophisticated, environmentally responsible process for applying powder-coat paint and handling the overflow and air quality.